When a screen shot has been captured and is ready to be sent to the server, the user will be notified. He or she can decide to approve or deny the screen shot. 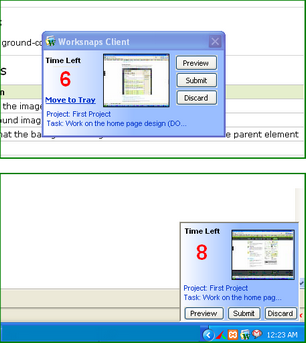 Users can also configure the client to run silently in the background. Users can easily suspend the client when necessary and resume it at a later time. Worksnaps helps improve efficiency for everyone while respecting your work habits. A user can set Worksnaps to run in private mode so that the logged screenshots and activity will only be visible to himself. The user can review them at a later time and then determine what to make visible and billable. 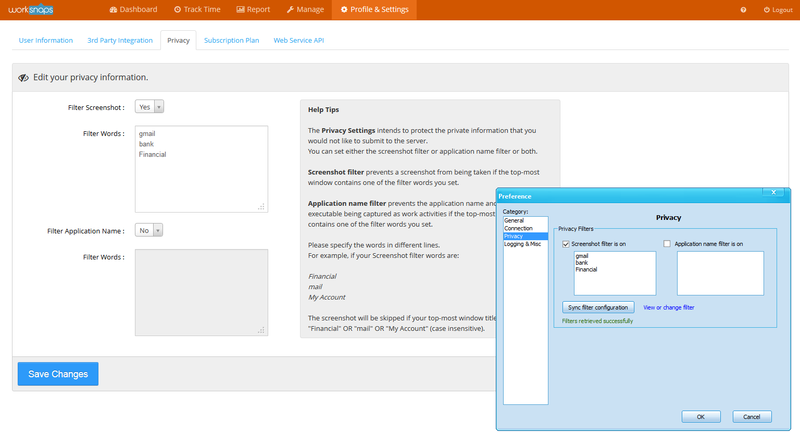 A user can set up the privacy filters so that sensitive information will not be sent to the server. 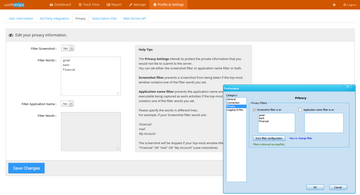 Filters can be set up for screenshot capturing and application name recording.